Male Republicans support separating families trying to cross illegally into the U.S. from Mexico, but most other groups — and Texas voters overall — do not, according to the latest University of Texas/Texas Tribune Poll. 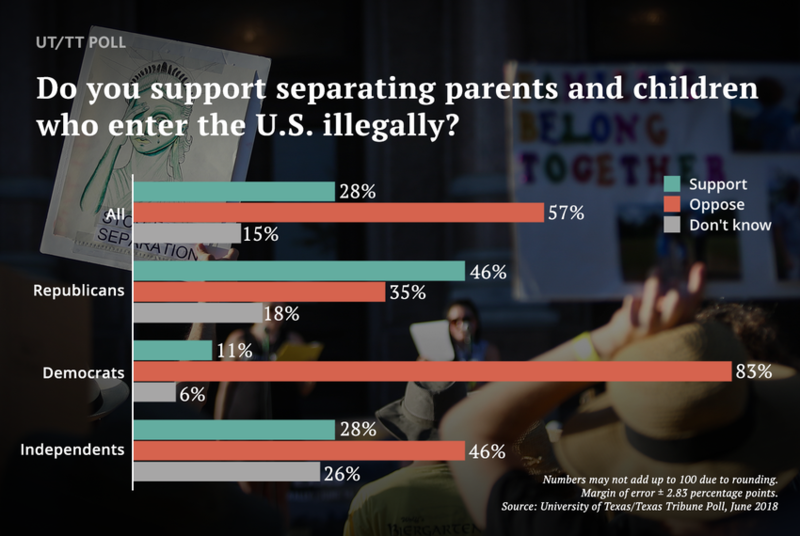 Most Texas voters oppose separating children and parents apprehended while trying to enter the country illegally, but there are gaping partisan and gender differences in the electorate, according to the latest University of Texas/Texas Tribune Poll. Generally speaking, men are more likely than women to say they support “separating children and parents who are apprehended while trying to enter the U.S. illegally,” and Republicans are more likely than Democrats to support the practice. Overall, 28 percent of Texas voters support the practice — 16 percent strongly so — while 57 percent oppose it — 44 percent strongly so. Black voters (62 percent) were more likely than either whites (57 percent) or Hispanics (55 percent) to oppose family separations. And they were least likely to support the practice: 23 percent of black voters, 27 percent of Hispanic voters and 31 percent of white voters said they support separating families entering the country illegally. The partisan gap was striking. While 83 percent of Democratic voters oppose the separation of parents and children at the border, only 46 percent of independents and 35 percent of Republicans were opposed. A plurality of Republicans — 46 percent — said they support the practice; among independents and Democrats, opponents outnumbered supporters. Tea Party Republicans favor the practice 55 percent to 30 percent; non-Tea Party Republicans favor it by a smaller margin of 45 percent to 38 percent. Overall, 64 percent of women voters oppose the separation practice, and 50 percent of the men agree with them. Among Democrats, there’s some accord, with 86 percent of women and 78 percent of men opposing family separations. On Wednesday, President Donald Trump signed an executive order halting the separations, sticking with his position on strong borders while saying families will be kept together. Some Republican voters might have misgivings about family separations, but their concern about the Texas-Mexico border hasn’t wavered. Border security and immigration continue to top Texas voters’ list of the most important problems facing the state. That’s driven by Republican voters, more than half of whom listed either immigration or border security as their top concern. Tea Party Republicans were most likely to choose those two items; 59 percent of them did so. Moral decline was a distant third on GOP voters’ list, with 6 percent listing that as the top problem facing the state. Less than 10 percent of Democrats listed those two items. Their top concerns were political corruption/leadership (16 percent), gun control/gun violence (11 percent), health care (11 percent) and education (10 percent). Political corruption/leadership, immigration and moral decline topped voters’ concerns about the country. Democrats put political corruption/leadership at the top of their list (23 percent), while the Republican list was capped by immigration and moral decline, each listed by 18 percent of GOP voters. Border security was third, at 10 percent; combined with immigration, it was chosen as the country’s most important problem by more than a quarter of the Republican respondents. The Democrats’ list was rounded out by gun control/gun violence (14 percent) and health care (11 percent). The North American Free Trade Agreement is more popular with Democrats than with Republicans — a reversal from the early years of that 1990s-era pact. Overall, Texans have decidedly mixed views on NAFTA, which is currently being renegotiated by the United States, Canada and Mexico: 34 percent said they think it has been good for the state economy, 28 percent said it’s been bad and 38 percent said either that they don’t know or have no opinion about it. A majority of Democrats — 54 percent — said NAFTA has been beneficial to Texas, while only 17 percent of Republicans said that. Only 10 percent of Democrats said it was bad for the state, while 43 percent of Republicans said so. College-educated voters were more likely to favor the trade agreement, with 46 percent calling it a good deal and 26 calling it a bad one. By comparison, 30 percent of voters who didn’t go to college called it a good deal and 64 percent called it a bad one. Asked whether they agree or disagree with a statement about foreign affairs — “This country would be better off if we just stayed home and did not concern ourselves with problems in other parts of the world” —39 percent agreed and 51 percent said they disagree. Democrats were more inclined to disagree (63 percent), while Republicans were split down the middle, 46 percent to 46 percent.